If you’re organising an event elsewhere or simply can’t make it to our centre – do not worry – we have a range of portable activities that we take across all Ireland, from Derry to Belfast to Dublin to Cork, and we can bring them directly to you! Providing innovative adventure event solutions we work across Ireland at Council Events, Fetes, Schools, Fundraising ideas Northern Ireland, Birthday Party ideas Northern Ireland, Corporate Fun Days and Community Events to name but a few. This 20foot high portable climbing wall always proves a huge success at any event – its eye-catching, fun and the kids just can’t get enough of it! 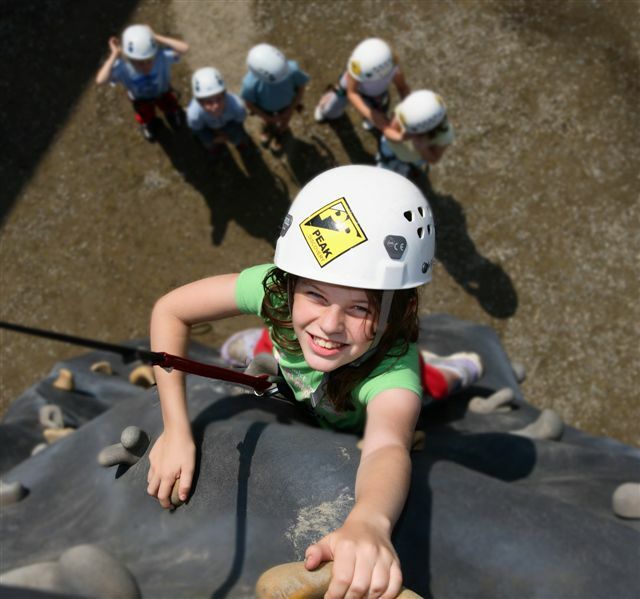 With four different climbs, up to four individuals can be on the wall at any given time and approximately 50 kids can have a go in the space of an hour. 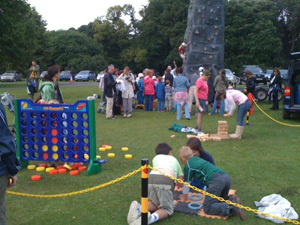 Also popular is mobile climbing tower and climbing tower Dublin. Giant Inflatable Go-Kart Track – the biggest in Ireland! Ideal for kids and adults, this inflatable track can be set up inside sports halls etc. or outside. 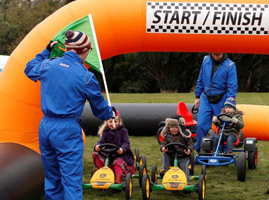 We have a range of themed go-karts available e.g. John Deere, and we also have 2-seater versions so adults can go with toddlers. The track is a real eye catcher and everyone loves going through the tunnel! Wellie boot throwing, Giant Connect 4, Giant Jenga, Group skis, Giant Dominos and much more. Can be set up indoors and outdoors, and are great for entertaining folks whilst in the cue for larger attractions such as portable climbing wall. Toddler soft play area also available for hire for infants. The next generation of target gaming, use the deactivated and modified shotgun to fire an infrared beam at a variety of targets. The system can be used either indoors or outside and due to its safe nature can be enjoyed by all the family, children and adults alike. Up to 5 players can play at any one time. This is self contained equipment, access to power is not required. 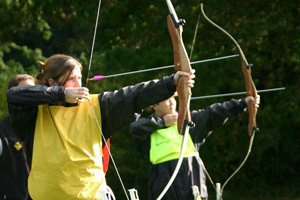 Less high tech but just as challenging, try your aim at archery and see if you’re the next Robin Hood or Maid Marion. 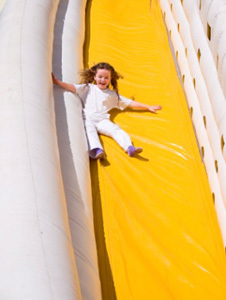 Although best suited to outside, this activity can also be run inside large halls etc. if the correct facilities are available. There are many ways to enjoy the thrills and challenge of abseiling, you do not have to be on a mountain! For example abseiling Carrickfergus Castle as seen in photograph, or abseil off your local church, apartment tower block, viaduct etc. Our inflatable slide is 30 feet high and has a fire engine theme, it is a great eye catcher at any event and is just as popular with adults as it is the kids! Can be set up indoors or outdoors. Orienteering Northern Ireland – hire our mobile courses which can be set up at your desired venue. Suitable for kids as young as 3+ years old up to adults. 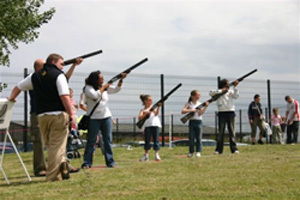 A range of courses and competitions are available to suit various age groups. With high tech equipment on board, teams will search out a list of prey. Can be run to incorporate local features/attractions and can be done in both rural and urban settings. Get up close and personal with some of the worlds most majestic birds of prey in either a static or flying display. A firm favourite with kids of all ages! You can be transformed into anything or anyone you want to be. Just use your imagination and let our professional artists transform you. Build and personalise your very own daft raft and pitch it against other teams efforts in a race to victory. Canadian Canoes and Kayaks are also available. A suitable water venue is required.